New Mocana TrustCenter™ Services Platform Ensures Supply Chain Integrity and Improves the Safety and Reliability of Mission-Critical IoT and Industrial Control Systems. 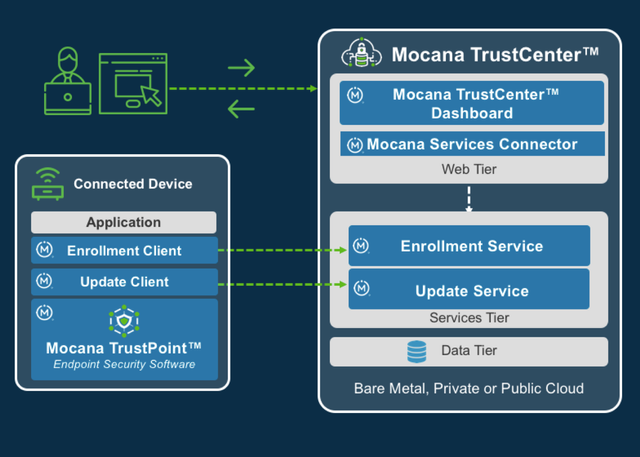 Mocana's TrustCenter automated services platform can be deployed on bare metal, private cloud, or public cloud Infrastructure-as-a-Service (IaaS) and ensures the trustworthiness of both the device and the data from end-to-end. Mocana TrustCenter’s automated approach reduces the time it takes to install secure credentials on a device from minutes to seconds. The platform automates secure device onboarding, enrollment and over-the-air (OTA) updates for IoT and ICS. Mission-critical systems used in aerospace, defense, industrial manufacturing, transportation, medical, and automotive will benefit from Mocana TrustCenter by automating the IoT security software integration process. Mocana Corporation, the leading provider of mission-critical IoT security solutions for industrial control systems and the Internet of Things, announced the launch of Mocana TrustCenter™, the industry’s first services platform that provides a comprehensive system to manage security across the lifecycle of IoT devices and industrial control systems (ICS). Developed for manufacturers and operators of IoT devices and industrial equipment, Mocana TrustCenter ensures supply chain integrity, offering full management of cybersecurity across the entire IoT device security lifecycle – embedded systems and software development, manufacturing, device enrollment, and secure firmware updates. The new services platform complements Mocana’s industry-leading TrustPoint™ IoT endpoint security software that protects more than 100 million devices today.